George Mason IV (December 11, 1725 – October 7, 1792) was a United States patriot, statesman, and delegate from Virginia to the U.S. Constitutional Convention. Along with James Madison, he is called the "Father of the Bill of Rights". George Mason wrote the Virginia Declaration of Rights, which detailed specific rights of citizens. In addition to anti-federalist Patrick Henry, he was later a leader of those who pressed for the addition of explicitly stated individual rights as part of the U.S. Constitution, and did not sign the document in part because it lacked such a statement. His efforts eventually succeeded in convincing the Federalists to modify the Constitution and add the Bill of Rights (the first ten amendments of the Constitution). The Bill of Rights is based on Mason's earlier Virginia Declaration of Rights. Although an owner of black slaves, and a plantation owner, Mason favored the abolition of the slave trade. He once referred to slavery as "that slow poison, which is daily contaminating the minds and morals of our people." However, he spoke out against including any mention of slavery in the Constitution — whether from an abolitionist or anti-abolitionist standpoint. George Mason was born on December 11, 1725 at the Mason family plantation in Fairfax County, Virginia. His father died in 1735 in a boating accident on the Potomac when the boat capsized and his father drowned. Mason had virtually no formal schooling and essentially educated himself from his uncle's library. On April 4, 1750, he married 16-year-old Ann Eilbeck, from a plantation in Charles County, Maryland. They lived in a house on his property in Dogue's Neck, Virginia. Mason completed construction of Gunston Hall, a plantation house on the Potomac River, in 1759. He and his wife had twelve children, nine of whom survived to adulthood. In 1752 he acquired an interest in the Ohio Company of Virginia, a land speculation company organized for the colonization of the Ohio Country. The activities of the company helped to provoke the outbreak of the French and Indian War. When the British revoked the company's rights in 1773, Mason outraged wrote his first major state paper; Extracts from the Virginia Charters, with Some Remarks upon Them. Mason began his political career as a justice of the Fairfax County court and a trustee of the city of Alexandria. The Virginia House of Burgesses elected Mason in 1759. Mason powerful writing style was employed during the outrage over the Stamp Act of 1765, he wrote an open letter explaining the colonists' position to a committee of London merchants to enlist their support. Mason soon was composing documents for several political events. In 1774 Mason helped George Washington draw up the Fairfax Resolves, in response to Great Britain's punitive measures taken against Massachusetts in the Coercive Acts. Mason spent the years between 1776 and 1780 writing for establishment of a government independent of Great Britain. In 1780 he grew disgusted with the politics and retired. He came out of retirement when he was appointed in 1786 to represent Virginia as a delegate to a Federal Convention, to meet in Philadelphia for the purpose of revising the Articles of Confederation. He served at the Federal Convention in Philadelphia from May to September 1787 and contributed significantly to the formation of the Constitution. "He refused to sign the Constitution, however, and returned to his native state as an outspoken opponent in the ratification contest." One objection to the proposed Constitution was that it lacked a "declaration of rights." As a delegate to Virginia's ratification convention, he opposed ratification without amendment. Among the amendments he desired was a bill of rights. This opposition, both before and during the convention, may have cost Mason his long friendship with his neighbor George Washington, and is probably a leading reason why George Mason became less well-known than other U.S. founding fathers in later years. On December 15, 1791, the U.S. Bill of Rights, based primarily on George Mason's Virginia Declaration of Rights, was ratified in response to the agitation of Mason and others. At the convention he was one of the five most frequent speakers and he always spoke with confidence. He believed that slave trade should be abolished, even though he himself owned slaves, he believed in the disestablishment of the church, and he was a strong anti-federalist. He wanted a weak central government, divided into three parts, with little power. Most power would be left to the governments of the several states. George Mason died peacefully at his home, Gunston Hall, on October 7, 1792. 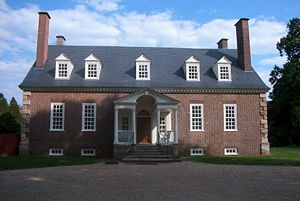 Gunston Hall, located in Mason Neck, Virginia, is now open to the public. The George Mason Memorial is located in East Potomac Park, Washington, DC, near the Thomas Jefferson Memorial; it was dedicated on April 9, 2002. A major bridge connecting Washington, DC, to Virginia is officially named the George Mason Memorial Bridge (it is part of the 14th Street bridge complex). George Mason High School in Falls Church, Virginia and George Mason University in Fairfax, Virginia, are named in his honor, as are Mason County, Kentucky, Mason County, West Virginia and Mason County, Illinois. ↑ The New United States of America Adopted the Bill of Rights: December 15, 1791 Retrieved December 10, 2007. ↑ John J. MillerAmazing Mason. www.nationalreview.com. Retrieved December 10, 2007. ↑ George Mason and the Bill of Rights Beginnings Retrieved December 20, 2007. Jeroen Daanen George Mason biography From Revolution to Reconstruction: and what happened afterwards. Project. This page was last modified on 15 June 2017, at 22:18.